The Word became a human being and, full of grace and truth, lived among us. It’s Christmas Eve in 1943 and the setting is a railway station somewhere in the United States. Eleven year old Gordy and his sister Priscilla and their mother are waiting for a train that will bring the children’s father home for Christmas. He has been on the battle fields of Europe. As the children wait for their father they look at the scary anti-German propaganda posters in the station and hear the whispers amongst the people at the station about the atrocities committed in the war by the enemy. A train was in the station waiting for clearance to move on. The two children get on board as they walked down the aisle they heard passengers talk about the prisoners that were on the train heading for a POW camp. They weren’t happy that such awful people should be on the same train as they were. They had no sympathy for the soldiers even though they were in box cars freezing and hungry. As they wandered among the people at the station, the children experienced the anger, hatred, the desire for revenge, sadness at the absence of family members from their Christmas celebrations because of the war. In the meantime, in the box car the German soldiers were talking amongst themselves as they contemplated their future. They had heard rumours of how cruel their enemy could be and were afraid of what would happen to them when they reached the prison camp. Eleven year old Gordy manages to overcome his fear and cautiously approaches the prison car. There, he connects with a young German soldier named Hans and finds that the soldiers are not monsters – just men who were cold and hungry. Gordy and his sister manage to steal some sandwiches and get some hot cocoa to Hans and his friends. Hans gives the boy his Iron Cross medal for his kindness. Gordy gives Hans a toy soldier that his father had given him. Hans tells him, "Sometimes even enemies can be friends, huh?" Quietly at first and then louder the people at the station start to hear singing. It was German. It was coming from the box cars. The Germans were singing "Stille Nacht, heilige Nacht". You can see the change that swept over the people on the station platform. Their hardness and anger changed to an expression of compassion and kindness as they replied by singing "Silent Night" in English. The words of the carol that talks about the birth of a ‘holy infant so tender and mild’, ‘Son of God, love’s pure light’ melted the icy coldness between the people of two warring nations. The movie finishes with Hans in the box car saluting Gordy as the train pulled out of the station – everyone that night had been changed through a little boy and his sister whose innocence and love reflected the innocence and love of the baby they had sung about. In John’s Gospel we read, ‘The Word became a human being and lived here with us. From him all the kindness and all the truth of God have come down to us’ (John 1:14. Christmas is about God becoming a human and living here on the earth. God come down from heaven; born in a stable in Bethlehem. This baby in a manger has brought to earth grace, kindness, and truth and everyone who is touched by the Word made flesh is affected by the grace, kindness and truth that fills their life. That’s what happened that night at the railway station. Gordy and the people on the platform were touched by the grace, kindness and truth of the Christ-child as the words of the carol reminded them of what God had done for them through the birth of Jesus. The grace and love of the Christ-child touched both the soldiers in the prison car and those on the platform. This is what Christmas is really all about. Last night (Christmas Eve) we reflected again on the events that took place when Jesus was born. their visit to the stable and their joy at seeing the little one lying in a manger – the promised one who will rescue all people from their sin. As we hear the story, see nativity displays and retell the story for our children and grandchildren we can’t help but be moved by the simple and beautiful events that surrounded Jesus’ birth. It’s easy to tell the story as just a story or become so engrossed in the scene depicting Mary and Joseph, the baby in the manger, the kneeling shepherds and the approaching wisemen with expensive gifts and be so taken by how beautiful it all looks that we miss the whole point of what this scene is about. And so we come to Christmas Day. We come celebrating what God has done through this birth in Bethlehem and why he has gone to such extreme measures in becoming a vulnerable and helpless child. be born in a place ruled by the cruel and power-hunger King Herod. Why does God go to such extremes? The story of Jesus’ birth holds the answer. When Jesus is born an angel announces what the birth of this child is all about. The angel says, ‘This very day in David's town your Saviour was born—Christ the Lord!’ The angel makes it quite clear that the one whom we see in the centre of the nativity scene is the one who saves. He is the one who will give his life to save everyone from sin and death. Everyone who believes in him will not die but have eternal life (John 3:16). He is ‘your’ Saviour (with an emphasis on ‘your’). There is no mistake for whom God has come into the world. This is God come from heaven to earth for you and me. He is Christ – or the Messiah – the one expected for so many centuries and declared by the prophets. He is the Lord. He is God - the almighty all-powerful God who made the universe. He is God in the flesh. He is God who has become a human being and has come to live among us. What could be clearer ‘This very day in David's town your Saviour was born—Christ the Lord!’ The angel makes it quite clear that this is the reason why God has gone to such lengths to come into our world. And then John in his gospel tells us that the Word, that is, God who created all things, became a human being and lived here with us. Jesus came to bring into our world God's love and to show how far God's love would go in restoring the relationship between God and all people. God becoming flesh shows us how concerned he is about the sin in our lives and its fatal consequences. God becoming flesh gives us a look into God's heart. We see how his love for us causes his heart to ache for the way sin has affected our lives. God becoming flesh is God rolling up his sleeves, and getting down amongst all the problems of our world and doing something about. God becoming flesh at Christmas is about a baby who was born to bring salvation and rescue to you and me by giving his own life. You may have heard about the play that asks the question, "What did Joseph do the day after Christ was born?" On the day when Jesus was born, of course, it’s highly likely that he helped with the delivery; found the manger and put fresh hay in it; and sat with Mary admiring the little boy resting in the hay. But what about the day after? The play imagines that since Joseph is a carpenter, he borrows some tools, finds some wood and begins making a crib for Jesus. 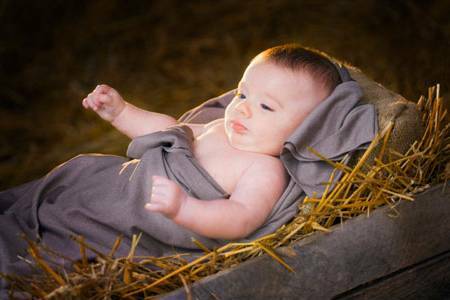 And as he does, he ponders over what had happened the night before and asks the question, "If they treated him like this when he is just a baby, how will they treat him when they find out he is the Son of God?" The lights suddenly go off, and all you can hear is Joseph’s hammer hitting against the wood and a light momentarily flashes on a wooden cross. How would they treat him when they found out he was the Son of God? The sound of a hammer striking nails would again be heard as nails pierce his hands and feet. From the very beginning of the Christmas story the shadow of the cross falls across the manger. The manger and the cross belong together. God made flesh in the baby of Bethlehem died for you and me. He died to give each of us the peace that comes from knowing that our sins are forgiven and the comfort that comes from knowing that beyond death is life in heaven forever. He died to change us – to give us new life, a changed heart that is loving, kind, understanding and forgiving, to live as God designed us to live. That’s what happened on the station platform when the carol ‘Silent Night’ reminded people of the peace and love that the angels talked about when Jesus was born. Hearts were changed because of Jesus. Their fear, their prejudice, their harshness and lack of compassion changed because of the baby born in a stable. As you sing the carols and reflect once more on the birth of our Saviour, you are invited to kneel before the manger and let the love of God bring about a change in you. Let it change you in such a way that everything you do will be directed by the love of God. New desires, aspirations and hope will now motivate your actions! You are set free from the burdens of the past! You have the peace that comes from knowing that your sin is no longer held against you. You have peace that comes from knowing that when this life is over God has prepared a place for you in eternity. You have peace when life takes some unexpected twists and turns because you know that Jesus is Immanuel – he is God with us at even the most difficult situations that we find ourselves in. He is our shepherd who will never abandon his sheep, even if it means sacrificing his own life to do so. We have a God who loves us, cares for us, forgives us and changes us to the people he made us to be - loving, caring and forgiving toward the people in our lives. ‘The Word became a human being and lived here with us. From him all the kindness and all the truth of God have come down to us’ (CEV).